Happy New Year from Jane and Station Stories!! Waiting for the 2.40 a couple of Fridays ago were : a regular who is a DVD pirate (he used to own a video library before net flicks put him out of business and this is his revenge) on his way with his bicycle to play Bingo, two hipster girls in black having a little snuggle together and one of the regular English as a Second Language class groups. One tall (and very talented) African guy is dancing with an Indian guy (bollywood meets zulu dancing) while the rest of the class clap and make whistling noises. Monday – The Medic found two little kids, 12 and 9, running barefoot round the station and discovered they’d run away from foster care the night before. Since the older child was mentally handicapped it was the younger who was the brains behind this scheme. He persuaded them to come into the station for muffins and trainspotting till the police and Child Services arrived. Tuesday – A man was yelling racial abuse at a lady in a headscarf (this was the day after the Sydney Siege.) Other customers stood up for her and the police arrived and took him aside for stern talking-to. One of the few good things to come out of this horrible event is the “#I’ll ride with you movement which makes me kinda proud. Wednesday – I drew the short straw and got the job of cleaning vomit out of the sink in the women’s toilets. This is a matter of pouring water into the sink and then massaging the contents with a toilet brush till it all goes down the plug hole. A customer poked her head in the door while I was doing this and we had a ruefully humorous conversation about the nastiness of it all. When I emerged from the toilets feeling as if I’d never be clean again, I discovered that she had paid for the kiosk to make me a coffee as a reward for the task. Bless her! The coffee went down a treat. Thursday – Technology failure!!!!! All the screens went blank and I was forced to rely on the paper timetables in order to give train information. (OMG! Quelle Horror! )With the help of the people in the control room and the fact that the trains ran pretty much to schedule we muddled through bravely for an hour and a half until the screens came back and we were able to rejoin the modern world again. Friday – I’m went in early for Christmas morning tea and an exchange of Kris Kringles. 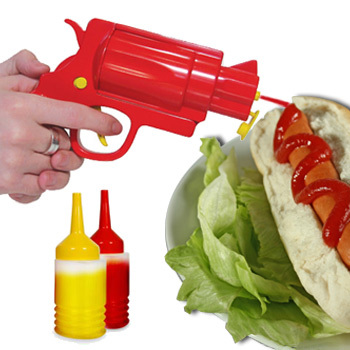 This year I drew one of the bosses and bought him a sauce gun – a plastic gun-shaped tomato sauce bottle. I figured this was the perfect gift for a man who is soon to have 5 children under 10 and look forward to seeing pictures of the resulting mayhem. And then I manned the barriers (sounds very Les Miserables, doesn’t it?) Mayhem occurred when a group of kids on bicycles invaded the station riding and chucking wheelies on the concourse and platforms and flipping us the bird when we asked (with increasing ferocity) that they stop. But Age and Cunning will always win over Youth and Beauty. One of them was unwise enough to leave his bike unguarded while he went to the toilet. I yielded to a bad impulse, put the bike in the lift and pressed it to go down to the platform. Then I locked myself in the office and made him beg me to tell him where it was. Satisfying, but I suspect ultimately it’s unwise to up the ante like that. Sunday – the thought of all that lovely overtime money comforts me as I stand by the barriers on my rubber mat (makes your knees ache less at the end of the day) in the chilly wind and hope someone is going to ask me a question before my brain explodes from boredom. Fortunately last weekend Stereosonic was on at the Showgrounds and droves of people streamed up the escalators to catch the special train on plat 6 giving me a chance to catch up on young folks fashion. Coloured hair seems to be all the rage this year but the dark haired girl with the tight yellow leggings and fake breasts in the leopardskin bra top seemed to be making an original statement of her own. They all had to go to the toilets. Since several of them seemed to go in at a time leaving a distinctly alcoholic smell behind them, I concluded they were just using them in the traditional way. We ran out of toilet paper and didn’t have the key to change it and since I could hear the young folks telling each other to take some extra loo-paper to use later, I figured putting a loose roll in wasn’t going to last long. So in the interests of everyone getting an equal share, I doled out bits to the toilet goers. After five years of study at Victoria’s best universities, it has come to this. I am a glorified toilet attendant.